Each day in the world passes by with innumerable births and deaths. The birth of someone brings joy to us; however, the death of someone is a painful event for all of us. However, everyone has to deal with the death of loved ones sometime during their lifetime. Whenever one faces the situation of death, one’s mind is filled with many questions such as why does one die? Where does one go after death? How can one overcome the grief? Why was I born? What is the purpose of my life and how am I going to fulfill it? The Bhagavad Gita, the Timeless Wisdom of Universal Truth for the humankind not only answers these questions, but also helps to understand the meaning of birth, death, overcome the fear of death, live happily and peacefully; and still strive towards the Higher Purpose of life. The Spirit moves from one body to the next body until it unites with Self-God. 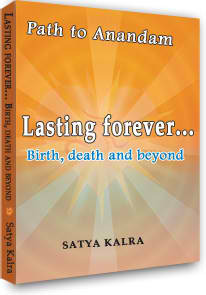 One you focus on attaining the supreme goal of life, you will learn to know the meaning of birth and death.